The DaVinci Kalani 4-in-1 Convertible Crib with Toddler Rail is more than just your average convertible crib, it is actually an award winning masterpiece that is considered by many to be the center piece of all the Kalani Collection by DaVinci beds. There are many aspects that make this baby bed with toddler rail so special – not only is it built very neatly and cleanly, but it also features non-toxic materials that are entirely safe around babies. DaVinci is widely known all around the world for being one of the baby product manufacturers that are truly committed to saving the planet by designing energy efficient and environmentally sustainable products, and the DaVinci Kalani 4-in-1 Convertible Crib with Toddler Rail comes to support that. This is a very stylish, safe and reliable piece that is specifically designed to reduce the carbon footprint, and it is one of the most popular convertible cribs amongst both parents and expert reviewers. 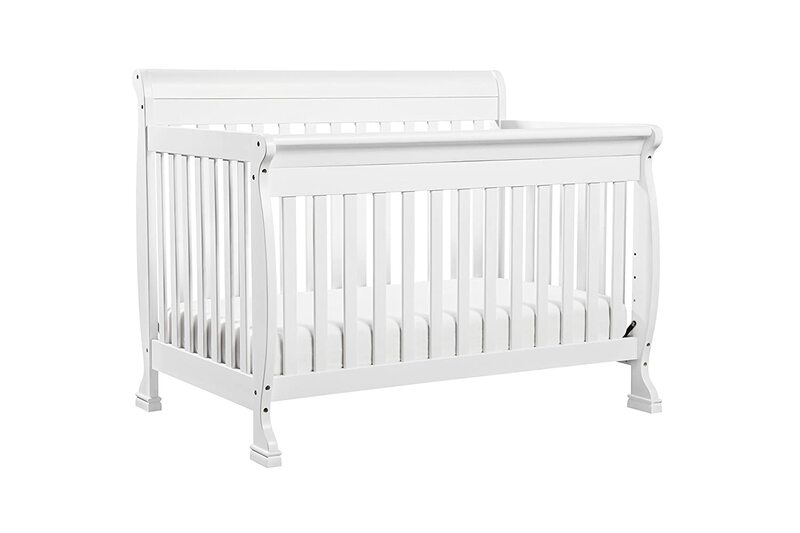 One of the most important aspects related to this unique crib is the fact that it is built exclusively from solid wood, it is very solid and sturdy, it has gentle curves and a truly tasteful design that appeals to just about anybody! The most important benefit of this baby crib is the fact that it is convertible and it actually encompasses features and functions from four different pieces of furniture, as it can serve as a day bed, as a full size bed, a toddler bed and ultimately a crib. The baby crib also comes with four different and fully adjustable mattress level that allows you to modify this convertible crib – in other words, the crib grows as your baby grows. Made from New Zealand pine wood of the highest quality, this crib will certainly become your baby’s new best friend. The baby crib also comes with four different and fully adjustable mattress level that allows you to modify this convertible crib – in other words, the crib grows as your baby grows. Made from New Zealand pine wood of the highest quality, this crib will certainly become your baby’s new best friend. The bed comes with non toxic finishes and it is also very breathable – this convertible crib with toddler rail is designed to not just meet the US safety standards, but to actually exceed them, thus offering parents the peace of mind they so much need, knowing that their little one is safe, sound and comfortable. Moreover, the convertible bed also features metal and spring mattresses for optimum support throughout the baby’s all growth stages, it comes with extra strong slats for added security and it is also JPMA, CPSC as well as ASTM certified. Although the benefits of this convertible crib with toddler rail certainly outweigh its downsides, parents have complained about the fact that the crib is not sturdy enough when converted to a toddler bed. Also, some of them claimed that the screws holes are not solid enough, and that replacing the broken pieces or the bent metal mattress frames can turn out to be rather expensive. On the other hand, some have even claimed that the wood is too soft and scratches very easily. Overall, this convertible baby crib with toddler rail is the perfect choice for concerned parents who are looking for a versatile and easily adjustable bed, and who know that safety and security should come first for every child.